Visitors to the American Treasure Tour Museum could easily forget that there is a lot that has to happen behind the scenes to make our well-oiled machine operate as smoothly as it does. That requires the proper equipment sometimes, things like those newfangled computers the kids are talking about these days. 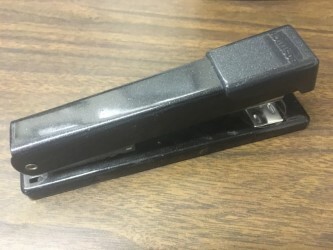 But any effective office that still uses paper, even once in a while, needs a good stapler to keep that paper together. We have a number of different staplers throughout the massive complex here at the Treasure Tour, but today we're going to give a call out to our Bostitch Model B515. The first commercially successful stapler was introduced way back in 1879, shortly after the Centennial Celebration in Philadelphia. Organizing papers was a big thing back then, as bureaucracy expanded and paperwork increased, a way to keep it together became more and more important. Thomas Briggs, an Arlington, Massachusetts man, established the Boston Wire Stitching Company in 1896. Briggs had developed a machine that literally stitched coils of wire into books, a type of binding for commercial purposes. They expanded and, in 1914, introduced their first table-top stapler they called a "portable stapling machine." The rest, as they say, is history. The name of the company was shortened to Bostitch from Boston Wire Stitching. During World War II, they produced Browning Automatic Rifles for the military, then returned to stapler manufacture, where they've been ever since. Now, Stanley Works owns the company, which has its offices in East Greenwich, Rhode Island.